Every year, about two weeks before Halloween, people start talking about NaNoWriMo. They began mentioning possible ideas, blog about their plans, start threads on message boards to meet other participants, start asking if others plan to give it a go this year, and generally behaving as though this is a great, fun game. In fact, the concept of writing a novel as a game is so interwoven in this month that there are "winners" and "losers." What do you have to do to win? Finish 50,000 words, of course! That's it. That's all. It actually seems like a rather harmless activity. One that I shouldn't have any issue with. It keeps people occupied and happy and hell, I'm always posting encouragement to writers. I love helping new writers--I'm a writing teacher for God's sake! But I hate NaNoWriMo, and I'll tell you why. Memoirs are sometimes difficult things to read. When done well, they can often cut too close to the bone, creating a schism amongst a reader’s reactions. When done poorly, they are just like any other genre and end up getting dismissed as self-indulgent, or a waste of reading time. 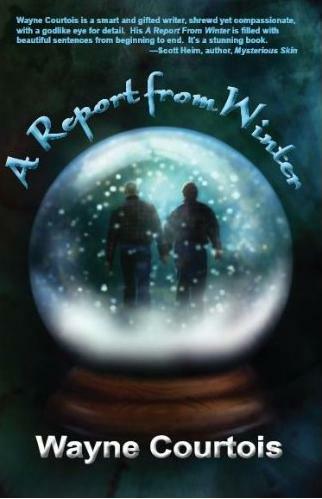 A Report from Winter falls into the former category, and while the subject matter of a parent’s death might not necessarily lend itself to casual reading, the writer’s keen, stark prose and decidedly unidealistic approach to the people in his life more than make it worthwhile. Leaves are changing color, the air is crisp, and you're noticing Mason jars on the shelf at your local grocer or hardware store. Perhaps you idly wonder who, at this point in history, has time for home preserving. Then you move on, filling your cart with commercially packaged jars, cans, and cardboard boxes. But what if you decided to give canning a chance? Sounds hilariously old-fashioned, doesn't it? What's next, a pickling crock? (Well, okay, I do use one of those, but let's not get ahead of ourselves.) 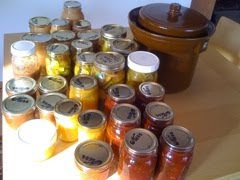 Rumor has it some people take up home canning because they want to create delicious concoctions or because they want to carry on family traditions. Me, I started three years ago in self defense. My partner Joe and I haven't yet managed to convince our two cats to eat fruits and vegetables, and when we signed up for a community-supported agriculture program we had no idea there would be weeks we'd get twelve pints of blueberries or several heads of cabbage at once. We only have so much fridge space; it was either going to be home canning or drowning in produce. Occasionally, I get it in my head to experiment with something new. These impulses are usually short-lived and relatively harmless, but during my bouts of activity, I learn all kinds of fascinating things. Earlier this year, I learned that you can make a pretty decent cake from scratch. I also learned how to make cornbread stuffing (from scratch), how to brine turkey, and how to make my own pasta. A different sort of madness possessed me this year. I wanted to learn about pumpkins. Specifically, I wanted to learn how a pumpkin became a delicious, delicious pie. Like so. With All Hallows Eve right around the corner, the pressure is on to come up with that perfect costume...whether you are hitting the crowded streets with wandering masqueraders, going to a friend's apartment for a shindig, or just staying home watching old Universal monster movies with a bowl full of candy for tiny trick-or-treaters, the right outfit is essential. 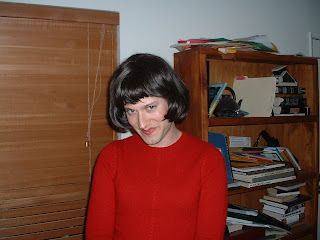 Looking back over my many years of dressing up for the holiday, there were a few times I nailed, and a few that to this day are a headscratcher. So here's a brief review of my personal dress-up experiences, followed by a guide to help you plan the best outfit for you!